ViBha National Anveshika Experimental Skill Test (NAEST) 2017, National Science Talent Contest (NSTC) 2017. Telangana, Vignana Bharathi has taken responsibility to coordinate this NAEST programm for the promotion of Experimental Learning of Science in India and to allow the teachers those who willing to attend the programme on the scheduled date i.e. 19th August, 2017 at different centres in Telangana. Sub: School Education Department - SCERT, Telangana, Hyderabad - Request for forwarding letter to DEOs/ MEOs in the State on conduct of "National Science Talent Contest (NAEST)"and allow them to conduct exam on 19th August, 2017 at different centres - Reg. Ref: Rc.No.Nil, dt: 25.07.2017 of the Coordinator, Vignana Bharathi, Telangana, Hyderabad. 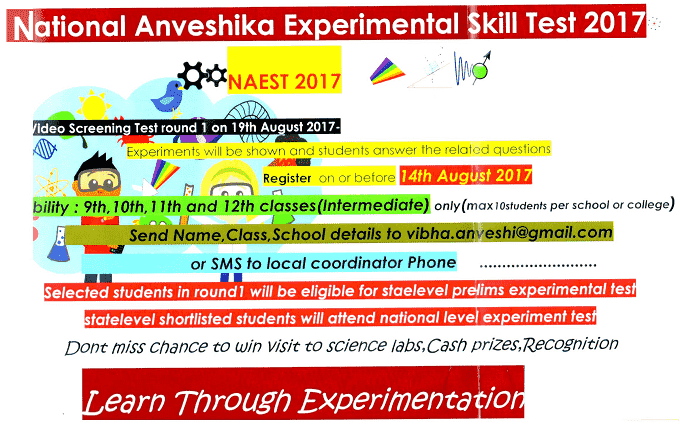 All the District Educational Officers in the State is invited to the reference read above, and they are informed that National Anveshika Experimental Skill Test (NAEST) is jointly being conducted by Vignana Bharathi, IAPT& llT, Kanpur in India for the students of class IX to XII standards on 19th August, 2017. In Telangana, Vignana Bharathi has taken responsibility to coordinate this programme. The programme involves following steps. 1. Screening level test: Screening level testwill be conducted at 14 centres in Telangana, the screening level test consists of showing experimental videos to students and students will answer the questions based on the video shown on projector. 2. For the screening level participation is allowed from students of class IX to XII to register their names (maximum of 10 students per school allowed) before 14th August, 2017. There is no registration f~e collected from the students. 3. The selected top 40 students from screening will be examined on experimental test which will be conducted in Hyderabad. The students will do the selected experiments and experts in science will examine the students. 4. There will be State Level Science Lab visits for the meritorious top level students selected in screening level and cash prizes awarded to the students. 5. The selected top two students will be allowed to compete with National Level at llT Kanpur in the month of September. in India and to allow the teachers those who willing to attend the programme on the scheduled date i.e. 19th August, 2017 at different centres in Telangana (enclosed). For further details, contact GLN Murthy, Coordinator, NAEST 2017, Cell:9704708505, vibha.anveshi@gmail.com. Above information is very relevant. I would like to add few more info,I found BRAOU Questions. Hope it will help other users also.